Order my book via Amazon, Barnes & Noble, Indiebound, Shambhala, or wherever good books are sold. In recent years,“mindfulness” has blasted into mainstream culture much as yoga did two decades ago, making “mindful yoga” an appealing trend. But how does mindful yoga evolve from a buzz-worthy concept to a lived experience? How do yoga asanas and pranayama support and express the practice of meditation? How do you explore the teachings of the Buddha through the vehicle of your own living, breathing, human body? Experienced yoga and meditation teacher Anne Cushman answers all these questions and more in Moving into Meditation, teaching us to deepen our asana practices with mindfulness meditation and enhance our meditation practice with asana. 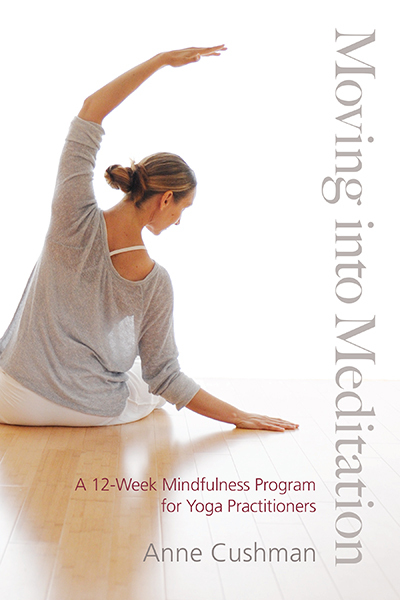 With compassion, humor, and deep intelligence, Moving into Meditation guides us through integrating mind, body, and spirit practices for a wide-awake life. downloadable video course that can help you dive deeper into each week’s practices. Move into intimate connection with your body, heart, mind, and life. Practice yoga as meditation in motion.